This picture is not actually from this weekend. 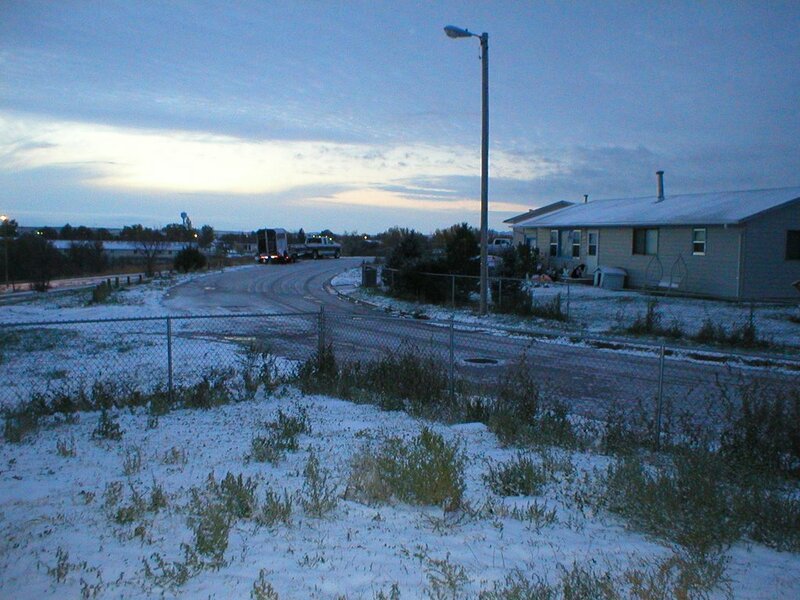 I took this on Tuesday or Wednesday morning, when I woke up to find snow on the ground for the second time this fall (winter?). Both times it disappeared by the time school was over. 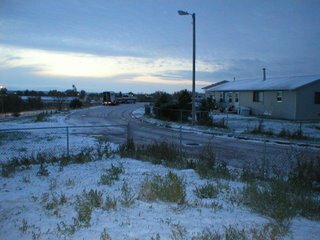 But this weekend was the most winter-y weekend yet, with snow blowing in and out as the wather hovered around freezing. On Thursday night, I talked to Ryan and Matt, and we all three decided we wanted to head out for the weekend early--as soon as school was out on Friday. Unfortunately we weren't able to recruit anyone else to join us, so after school I talked to them again, and decided to head down their way, hang out in Valentine, Nebraska, and hope to get some more people pulled into some kind of trip. We got some good steaks at the Peppermill and then I went to the Bunkhouse for the first time since July. And Bobby (the bartender) still remembered me. Now there's a good bar. After last call, we headed into the snow, back to St. Francis for the evening. 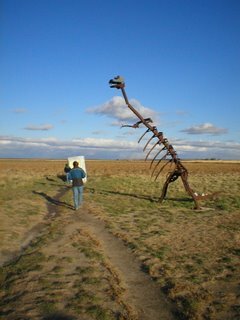 On the way in, though, we cut through a little jog in the time zone boundary that puts little old Kilgore, Nebraska (po. 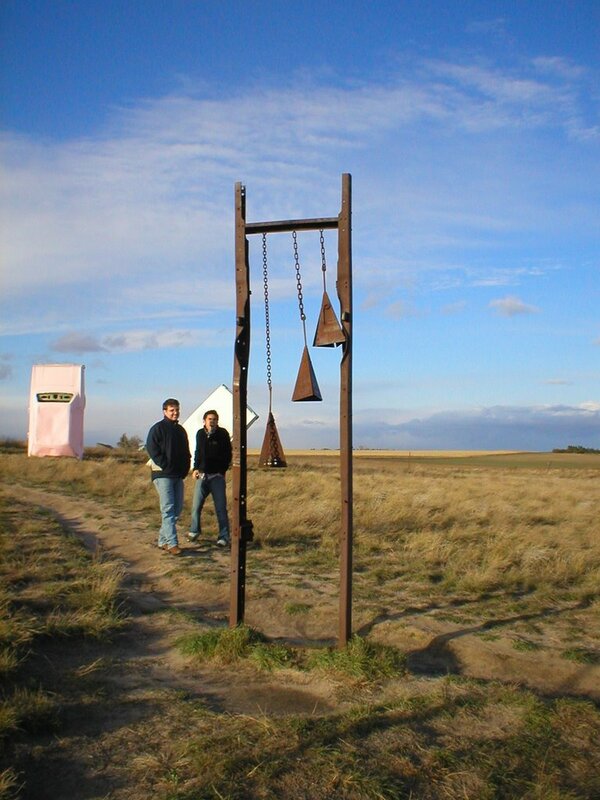 98), in the Mountain Time Zone. So the Kilgore Bar is open an extra hour. Why, you might ask, does a town of 98 have its own bar? (Actually, it has two.) 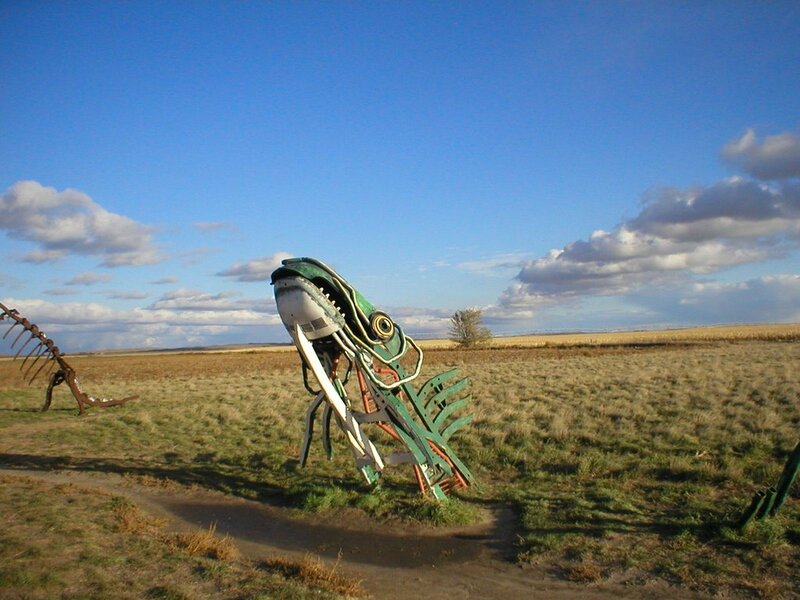 The answer, of course, is that this is a border town: just off the edge of Rosebud where, though it is legal to drink, there are no liscensed drinking establishments. In general, I disapprove of these kinds of towns, which prey upon the alcoholism that is so rampant on the reservations. But the Kilgore Bar was also a damn good time. The place is perhaps the least polished bar I have been in: plywood walls, pipes exposed in the ceiling, and folding chairs for seating. It was sort of uncomfortable when we first arrived; Ryan I were hassled when we first walked in, but then Ryan found his way to one of the aides from his school, and once we had an established connection we were welcomed with open arms. The standard entertainment seems to be darts--the dart machines are by far the most high tech things in the place--but on this Friday night, there was a benefit going for an Indian who had a brain tumor. Star Rider, which I'm guessing is a rez band, worked its way through a setlist including "Louie, Louie," "Tears in My Bear," and "Wipe Out," while we all got up shook our groove thangs. Ryan was an especially popular dance partner. Lee--Ryan's friend from St. Francis--bought us all around, and, for the second time of the night, we stuck it out till closing time. By the time we leaving Kilgore, the snow was coming down fierce. 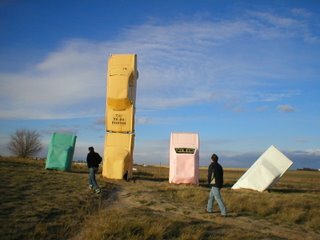 This was a bit of a harrowing situation: we were about to join what can only be called, political correctness be damned, a caravan of drunken Indians as we made our way up the one pretty rough county road between Kilgore and St. Francis--in a driving, blinding snowstorm. The question of the night was, what would your Mom think if she knew you were doing this. Well, Mom, I'm sorry: I know it was stupid, it was scary, and I'll be avoiding that one from here on out. Luckily we beat the rush, and Ryan drove slowly and carefully in the storm. After we let one car around us, we didn't see another car for the whole 18 miles. 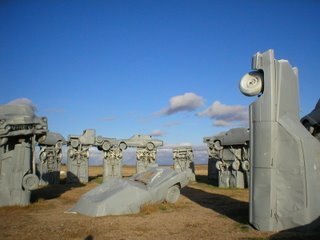 On Saturday morning we woke up and settled on our destination for the day: the glory of Carhenge, in Alliance, Nebraska. After this decision, though, it took us a significant amount of time to muster up the co-travellers we had managed to recruit. Finally, at 3 PM--nearly 24 hours after we had hoped to get out of town--we hit the road. (But as Ryan said, "Getting out of town at 3 PM is better than not getting out of town at all.) 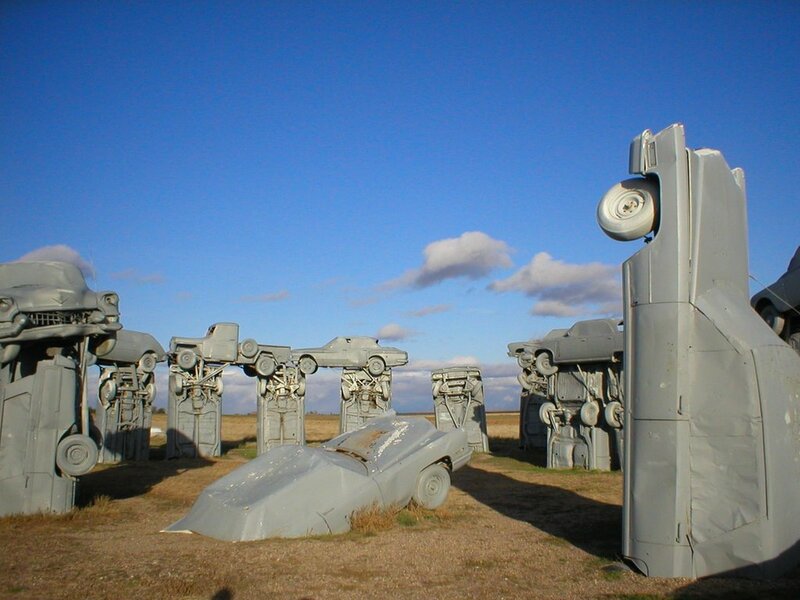 There was some debate about whether or not we could make it to Carhenge with light remaining but in the spirit of relentlessness we decided to stick to our guns. 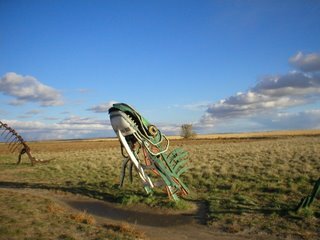 It was an uneventful trip through the clouds and the Sand Hills, but the snow did start to build up slowly, and by the time we pulled into Gordon for gas and snacks it was swirling around us, making the prairie beautiful in a new and homey way. I was looking forward to a cozy motel room on a snowy night, but alas, soon after we left Gordon the clouds cleared up--and it had been above freezing the whole time anyway. 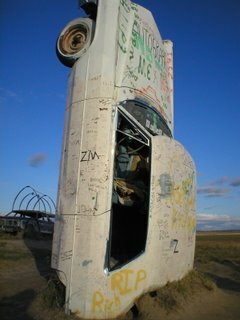 At 4:30 MT we finally arrived at Carhenge. We happened upon it pretty suddenly; if Carhenge were in South Dakota, the signs for it would start hundreds of miles prior, breaking you down until you had no choice to stop. And then it would be surrounded by a village of restaurants and tacky gift shops. 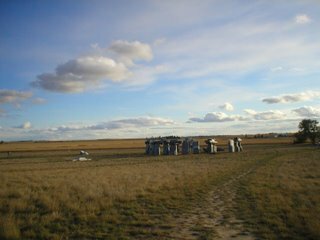 But the first sign we saw for Carhenge was at the site itself, and, as I'll relate in a minute, it took us a bit of effort to find souvenirs at all. 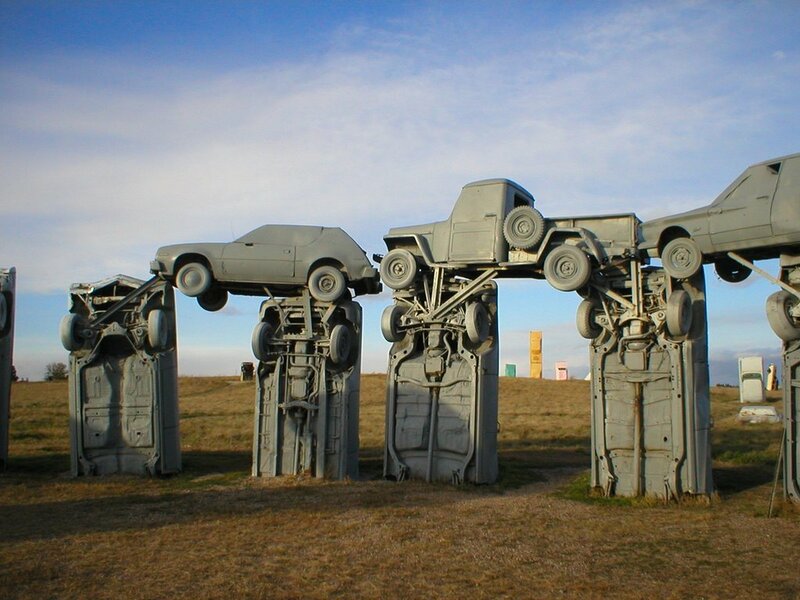 For those of you who don't know, Carhenge is a replica of Stonehenge, built with junked cars. 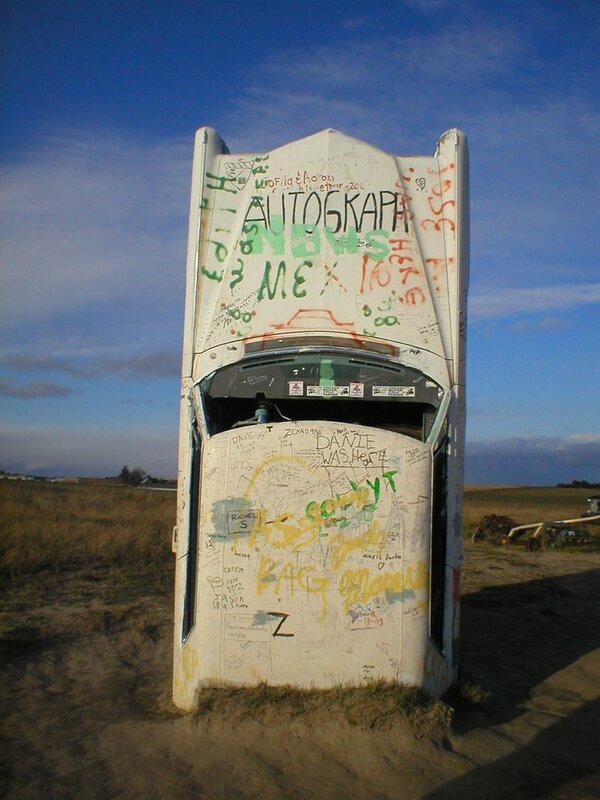 It is also on the cover of the AAA Nebraska/Iowa map, which apparently makes it the most photographable site in both of those states. 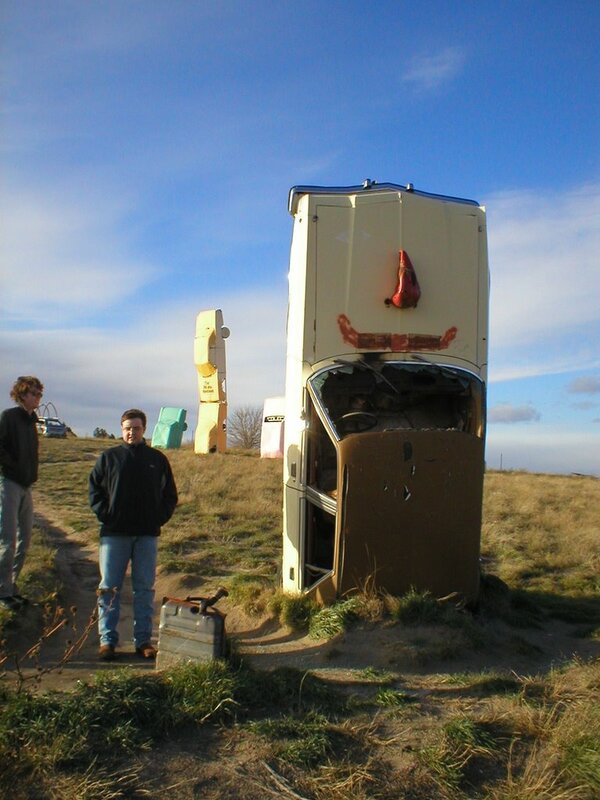 Our initial reaction upon arriving was, we drove two and a half hours for this? And then very quickly our reaction was, damn right we drove two and a half hours for this, this is ridiculous. And awesome. 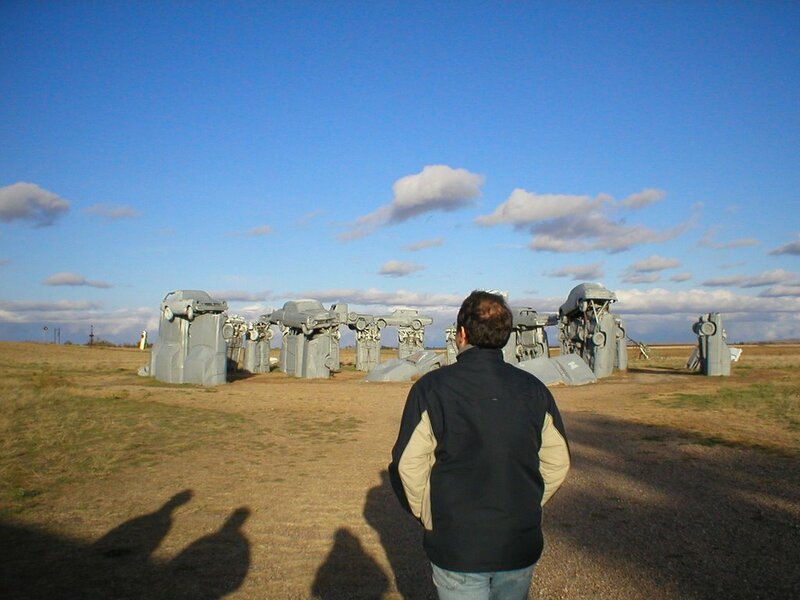 Strangely, the only information at Carhenge is a description of Stonehenge. 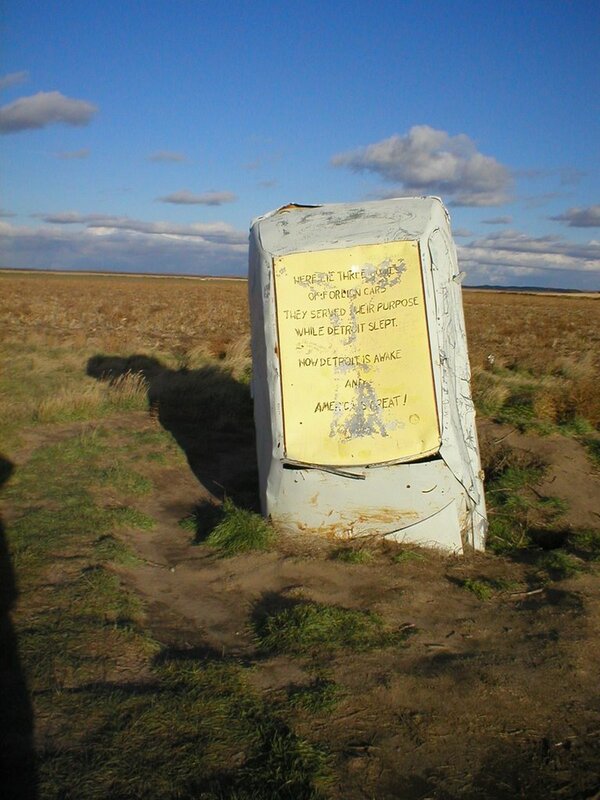 There is no explanation of why, how, or when this replica was built. It is actually one of the least in-your-face bizarre tourist attractions I've ever seen. Carhenge in the Nebraska landscape. Carhenge also has a "reserve" of automobile sculptures. Here is a dinosaur. 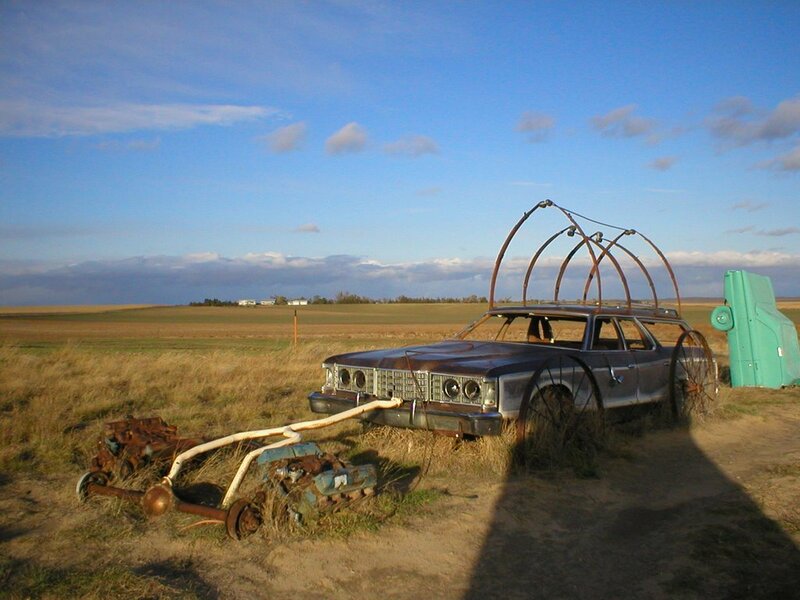 A covered wagon, a favorite symbol of Nebraska. A time capsule of some sort. I guess. "The Four Seasons," representing the four seasons of wheat growing. Question: why is autumn pink? 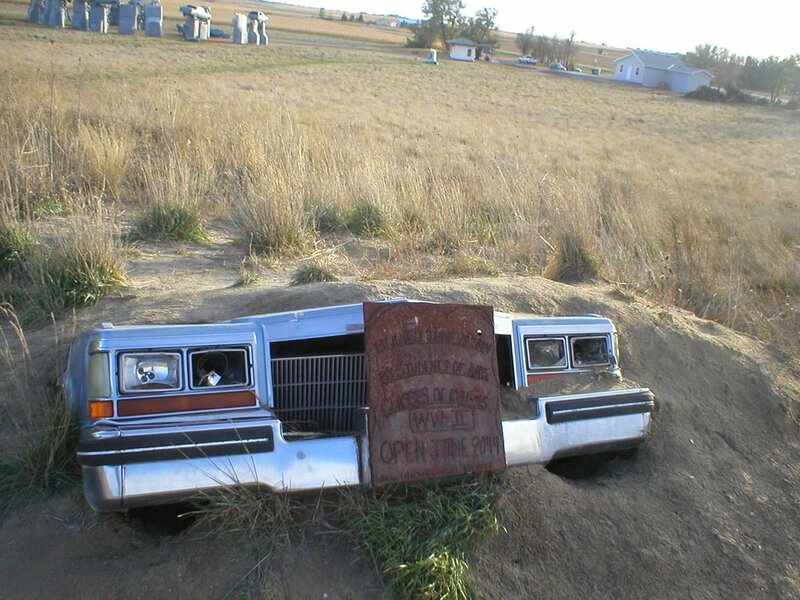 "HERE LIE THE BODIES OF THREE FOREIGN CARS / THEY SERVED THEIR PURPOSE WHILE DETROIT SLEPT / NOW DETROIT IS AWAKE / AND AMERICA IS GREAT!" 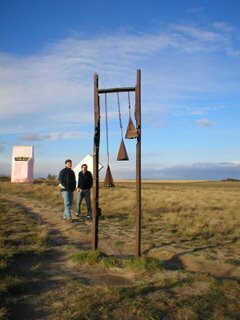 Wind chimes. It was windy. Some sort of face, only the eyes are missing. "The Autograph." Get it? Participational art at its best. Too bad we had no spray paint. 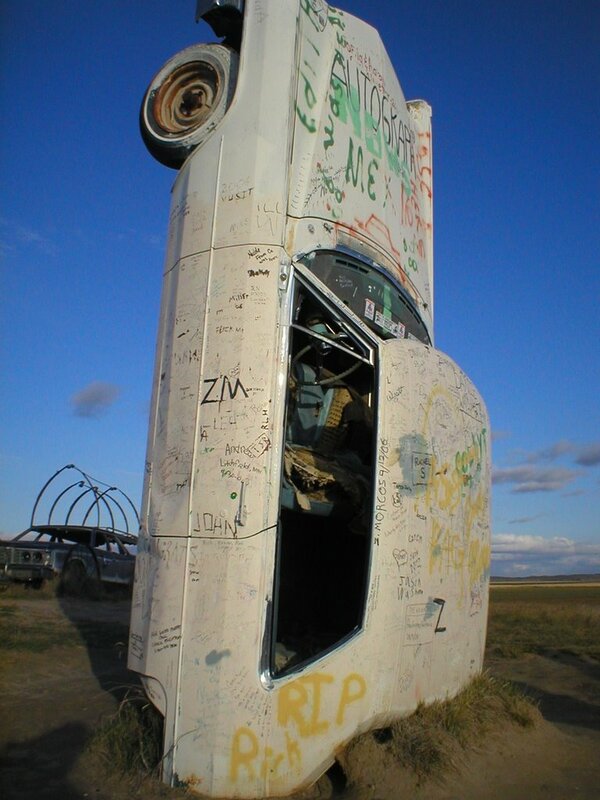 We didn't spent too long at Carhenge. The wind was biting, and since there was no admission fee we didn't really feel compelled to linger. 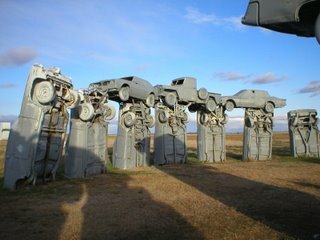 We filled up on the ridiculousness of the spectacle and then headed on into town in an attempt to find the Carhenge souvenirs promised to us by a small sign. We were surprised to find that Alliance, Nebraksa was a bustling town of 9,000, complete with an old, Midwestern downtwon of cobbled streets and prosperous looking stretch of hundred-year-old suburbia. It was pretty dead on a Saturday afternoon, though, and the Chamber of Commerce--our souvenir shop--was closed down. We made our way to gift shop a few blocks away, and, though they did not carry Carhenge souvenirs, we all bought jelly beans and talked to the woman working there for a while. Turns out souvenirs are hard to come by; some former government official had embezzlement lots of money that was supposed to go to Carhenge's upkeep. 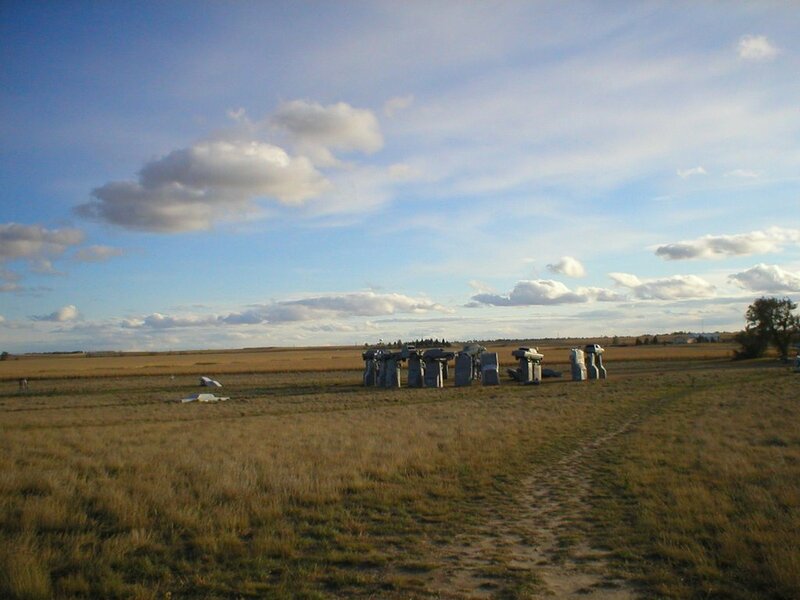 She directed us to go to the "Outpost," a gas station back towards Carhenge. There were found ugly t-shirts in too-large sizes and an array of postcards (and a bizarre selection of groceries, some of which looked at least twenty years old). 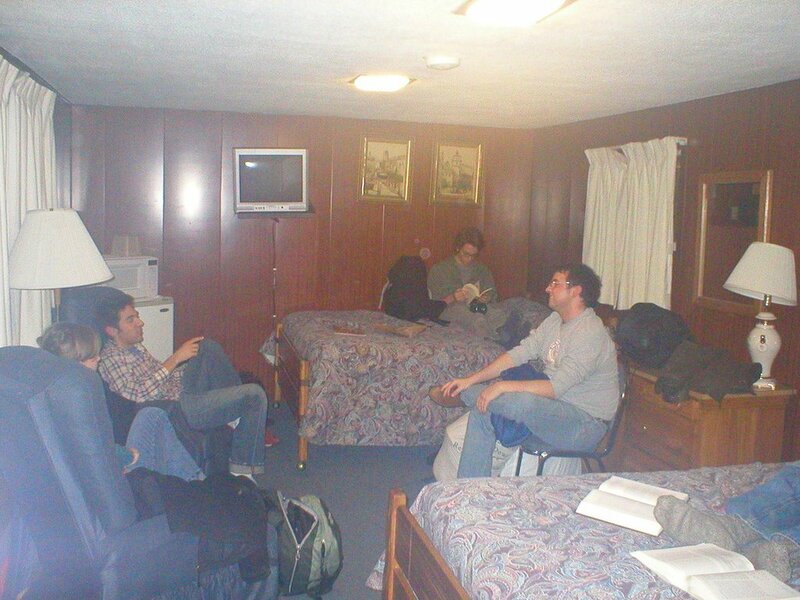 After browsing the selection, we headed back into town, secured ourselves a motel room and then got ourselves some decent Mexican food. 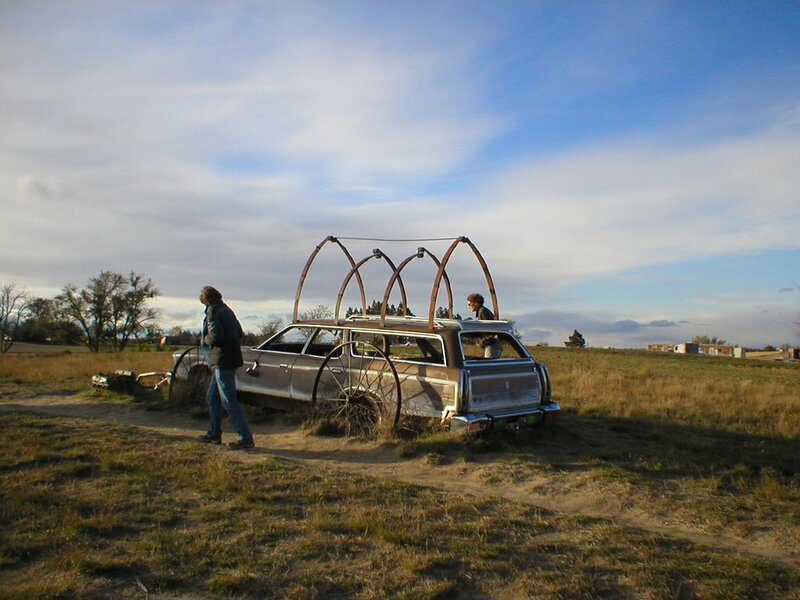 We took in a movie at the Alliance theater and generally marvelled at how we had coming to Alliance, Nebraska is now, for us, coming to the big city. Kids our age no doubt want to escape Alliance and get to somewhere more glorious, but for us it was just fine: we don't need anything more than a movie theater, cobblestone streets, and a bar to feel like we are in the big city. I mean, we even had to parallel park! Again at the recommendation of the friendly gift shop lady, we checked out the Gathering Spot, where a cover band perhaps more technically talented than Star Rider, but much less interesting, played an assortment of classic rock and early 90s alternative. It wasn't a particularly interesting bar; not much character, just the kind of place that could be found anywhere, East, West, or Mid-. The big, burly Nebraska boys glared me down as I ordered us a pitcher, and I actually felt less comfortable at the Gathering Spot than I did at the Kilgore bar. 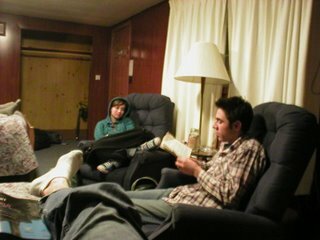 So after driking our round we retired back to the motel room. Jen wanted us all to bring 2-minutes of text to read aloud (We are teachers). 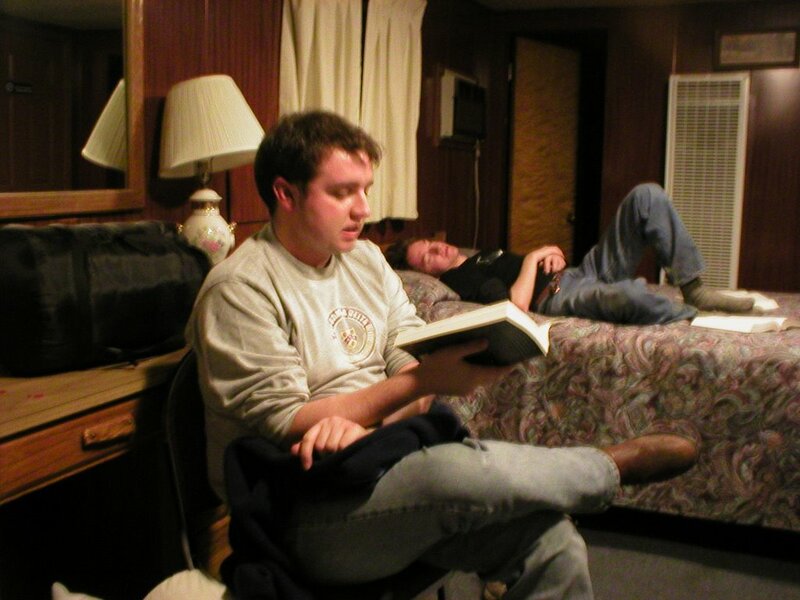 Here is Ryan reading from "Trout Fishing in America." Mr. Douglas reads from "Collapse" while Mr. Cox drowses in the background. More pictures coming as soon as I can get them uploaded.